Boo Roo and Tigger Too on 2nd February 2014 at 8:34 am. Jeannette on 2nd February 2014 at 3:47 pm. Jocelyn (@ihavecards) on 2nd February 2014 at 8:42 am. So beautiful – wish I could smell them! Jeannette on 2nd February 2014 at 3:46 pm. Redpeffer on 2nd February 2014 at 8:57 am. Kate Fever on 2nd February 2014 at 10:33 am. OneDad3Girls on 2nd February 2014 at 12:33 pm. Jeannette on 2nd February 2014 at 3:45 pm. Tas D on 2nd February 2014 at 12:49 pm. 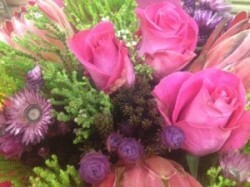 Very pretty flowers – i love the different pinks! Kim Carberry on 2nd February 2014 at 3:02 pm. Jeannette on 2nd February 2014 at 3:44 pm. Michelle on 2nd February 2014 at 6:18 pm. Jeannette on 2nd February 2014 at 7:39 pm. Coombe Mill (Fiona) on 2nd February 2014 at 8:45 pm. Jeannette on 2nd February 2014 at 11:53 pm. Lisa and Stella on 2nd February 2014 at 9:46 pm. Jeannette on 2nd February 2014 at 11:54 pm. Charly Dove on 2nd February 2014 at 11:48 pm.